Southern is assisting the town of East Haven in trying to prevent a repeat of major property damage inflicted upon the community two years ago by Hurricane Sandy. 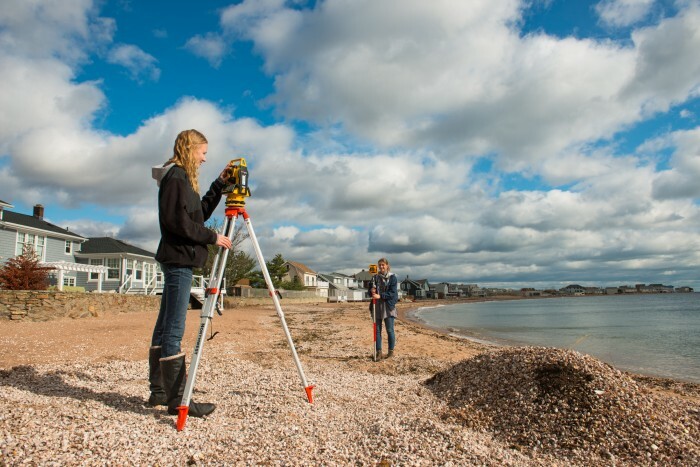 Michelle Ritchie and Fatima Cecunjanin, two students under the guidance of James Tait, professor of environmental studies, have been examining elevation levels along the coastline and how much of a factor they were in predicting damages. “In a sense, we have been looking for the black box for East Haven – what happened and what can be done to make the shoreline less vulnerable,” Tait said. In fact, that research earned them first place in the student poster competition at the recent New England-Saint Lawrence Valley Geographical Society’s annual meeting. Their work was placed into a broader context that included previous research conducted by Southern students related to the East Haven coastline. Among the students’ tasks are to create flood maps that can depict this kind of data, as well as make projections in terms of what would have happened if the storm had occurred during high tide in the greater New Haven area, according to Tait. Their work has caught the attention of staff members in the Office of the East Haven Town Engineer, who say they are impressed with the magnitude, quality and thoroughness of the research. In fact, they estimated that the work performed by the students and Tait would have cost the town several hundred thousand dollars if it had hired a company to do it. And some of the students’ work has been forwarded to the Federal Emergency Management Agency (FEMA). Meanwhile, Tait and some of his other students are also looking at the West Haven coastline. One of the students, Kaitlyn Stobierski, will do a cost-benefit analysis in terms of where it might be most cost effective to add sand and manage beaches. Stobierski, along with Catherine Cota and Steve Krozier have collected two years of data about beach stability. “The price to nourish beaches with extra sand has skyrocketed over the last 40 years,” Tait said. “It costs more than $800 per linear foot today, compared with about $55 per linear foot back in 1957, when a similar beach project was conducted in West Haven. Mark Paine, assistant to the commissioner of public works in West Haven, said he is excited about seeing the impending cost-benefit analysis. “The analysis will give us the ability to make informed and justifiable decisions,” Paine said. *The New Haven Register ran a story in its Sunday, Nov. 23, edition that profiled Stephen Hegedus, the new dean of the School of Education. **The recent forum, “Remembering the Fall of the Berlin Wall: 25 Years Later,” generated a slew of press coverage. The event attracted 300 people, including about 90 students from 4 area high schools — Shelton, Cheshire, Seymour and Sound from New Haven. *The New Haven Register ran a Page 1 article in its Nov. 8 edition that previewed the event. The article included an interview with Nicholas Burns, the keynote speaker who is a former State Department and National Security Council official. 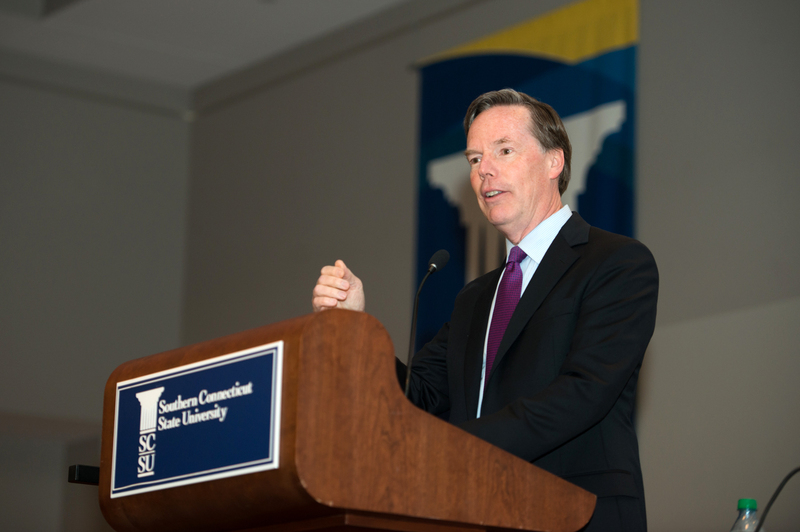 The Register also published a photo of Burns delivering the keynote speech in its Nov. 12 edition. *The Waterbury Republican-American ran a Page 1 story in its Sunday edition of Nov. 9 thatpreviewed the forum. The story included an interview with Kevin Buterbaugh, professor of political science, who was a panelist at the forum. 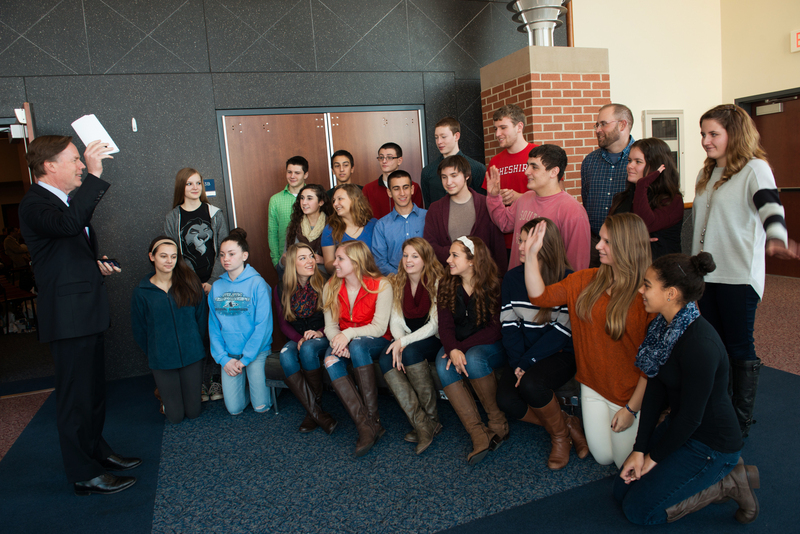 It also included interviews with a Seymour High School teacher and student who would attend the event. Troy Paddock, chairman of the History Department, was interviewed on Nov. 5 on the “Mornings with Ray Dunaway” show. Kevin Buterbaugh was interviewed Nov. 7 on the afternoon talk show with Joe D’Ambrosio. *CT-N covered the event and broadcast the program several times, initially on Nov. 12. *WATR radio (1320 AM) interviewed Kevin on Nov. 7 in advance of the event. *Channel 30 also interviewed Kevin on its Sunday morning newscast and previewed the forum. *The Fairfield County Business Journalpreviewed the forum in its Nov. 3 edition. 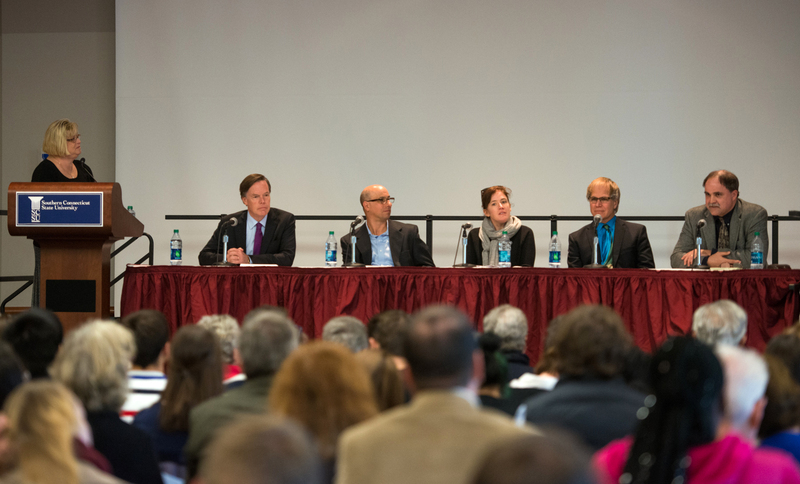 *The Connecticut Post published a post on Oct. 29 in its “Postings” blog that previewed the forum. It noted that classes from Shelton and Seymour high schools were planning to attend. *The Connecticut By The Numbers blog also posted an item on Nov. 7 previewing the forum. *The Hamden Times ran photos and a brief description about the forum that was published on Nov. 10. Marla McLeod had never painted before she took an art class with Rachael Vaters-Carr in her first year at Southern. The senior painting major from California arrived at the university with the intention of majoring in geography, but when Vaters-Carr encouraged her to try more art classes, McLeod fell in love with studio art, and with painting in particular. Now, she is graduating in December, and her senior thesis exhibition, “Black,” was on display in Earl Hall recently, with a closing reception on Friday, Nov. 21. McLeod says she wanted to express the show’s theme in a way that is aesthetically pleasing, but at the same time showing that the figures are coming from a dark place. Although the show’s title ws “Black,” McLeod says she intended for the works to be “representative of everyone, because everyone is stereotyped in some way.” The title refers to the place of darkness from which each figure in the paintings is striving to emerge. McLeod’s post-graduation plans include working on her painting portfolio in preparation for applying to MFA programs in painting. Studies have shown for decades that getting children interested in reading at an early age is crucial to their academic development. Those who are not at or near the reading levels of their peers by third grade generally face a much tougher road – not only in school, but in life. But what specific steps can parents and daycare providers take to spark an early interest in children’s reading? Julia Irwin and Dina Moore, associate professors of psychology, share some ideas in their book, “Preparing Children for Reading Success: Hands-on Activities for Librarians, Educators and Caregivers,” published recently by Rowman and Littlefield Publishers. 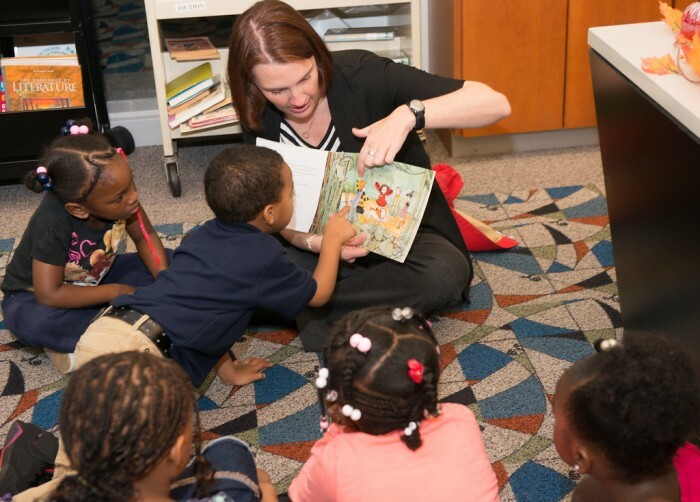 So, what can help parents make reading a centerpiece in their young children’s lives? The authors give many examples in their book. Dealing with emotions, such as fear and sadness, in an appropriate way can be addressed through reading. For example, Irwin points to a book such as “Dog Heaven,” by Cynthia Rylant, as providing a starting point for a conversation after losing a pet. For a child who has first day of school or daycare jitters, she recommends reading a book such as “Curious George’s First Day of School,” by Margret and H.A. Rey or “The Hello Goodbye Window,” by Norton Juster. The authors note that another way in which books can be relevant is by planning an activity around a book. For example, parents and their children can read “Gingerbread Man,” and then make gingerbread cookies together. Or, reading “Make Way for Ducklings” can be followed up by a trip to the local park to see ducks. A celebration of the new book is being held on Nov. 20 at Southern on the Green (900 Chapel St.). The event is co-sponsored by SCSU, Haskins Laboratories and R.J. Julia Booksellers. Southern’s School of Education has earned a full five-year reaccreditation from the Council for the Accreditation of Educator Preparation (CAEP)’s Continuous Improvement Commission. The commission issued its decision recently using the rigorous professional standards required by the National Council for the Accreditation of Teacher Education (NCATE), which is now part of CAEP. The School of Education met all six national standards, which measured the knowledge, skills and professional dispositions of the teacher candidates; assessment; field experiences and clinical practice; diversity; faculty qualifications and performance and the school’s governance and resources. The decision was welcome news to Stephen Hegedus, the university’s newly hired dean of the School of Education. “I am very pleased that once again CAEP has decided to continue the national accreditation of the School of Education at the initial and advanced program levels,” he said. “This indicates the quality and rigor of our programs. I am very proud of our faculty and staff in maintaining this great achievement. NOTE: The New Haven Register ran a story in its Sunday, Nov. 23 edition that profiled Stephen Hegedus, the new dean of the School of Education, and talked about the CAEP accreditation. Some 300 people of varying ages assembled recently at Southern for a forum in the Michael J. Adanti Student Center, Grand Ballroom. They were there to hear just how and why the Berlin Wall fell almost 25 years ago to the day. 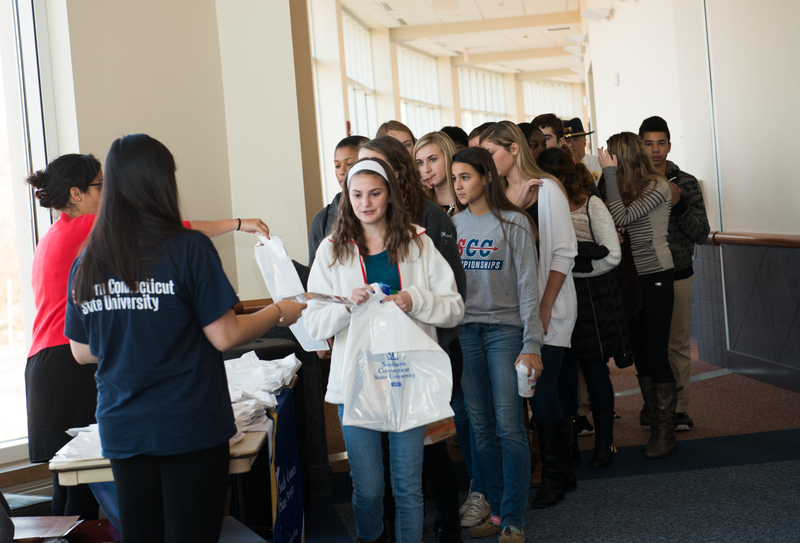 The forum, “Remembering the Fall of the Berlin Wall: 25 Years Ago,” attracted high school classes from Shelton, Seymour, Cheshire and the Sound School, as well as a group of senior citizens from the Guilford Senior Center, and various faculty, staff, students and members of the general public from every age group in between. Cheshire High School students respond to a question from keynote speaker Nicholas Burns before the start of an SCSU forum marking the 25th anniversary of the fall of the Berlin Wall. 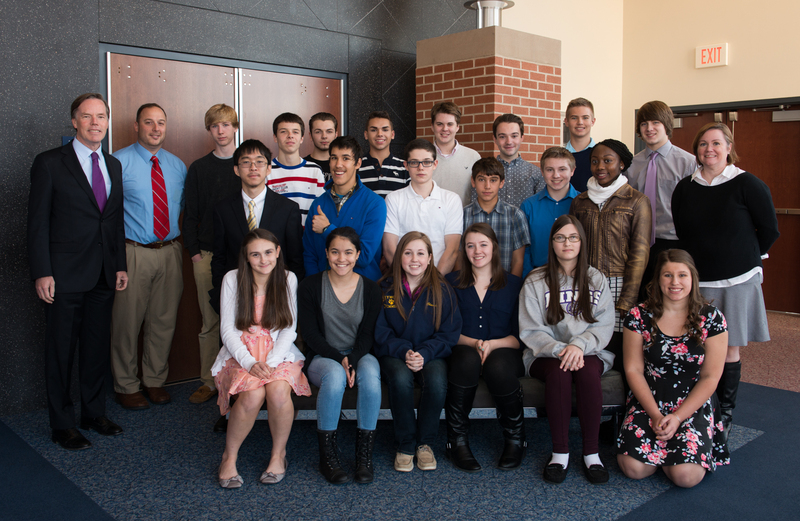 Seymour High School students pause for a moment before the forum with Nicholas Burns (standing, far left), and their history teachers Chris Pagliaro (standing next to Burns) and Heather Brown (standing, far right). 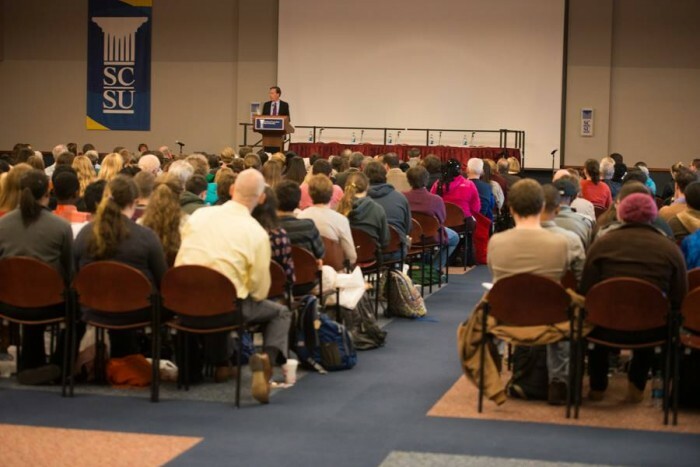 The attendees listened to the perspectives of the speakers, especially that of Nicholas Burns, a career U.S. diplomat who served in the State Department when the wall fell. He later was appointed to the National Security Council specializing in Soviet/Russian affairs, and would go to hold various positions, including the State Department’s third-highest position as undersecretary of state for political affairs. Today, he is a professor at the Kennedy School of Government at Harvard University. Opinions varied about the Berlin situation and the Cold War, to be sure, particularly with questions such as who and what were primarily responsible for the fall of the wall. But the windows by which they view the Berlin situation, and indeed the Cold War, were even more different. 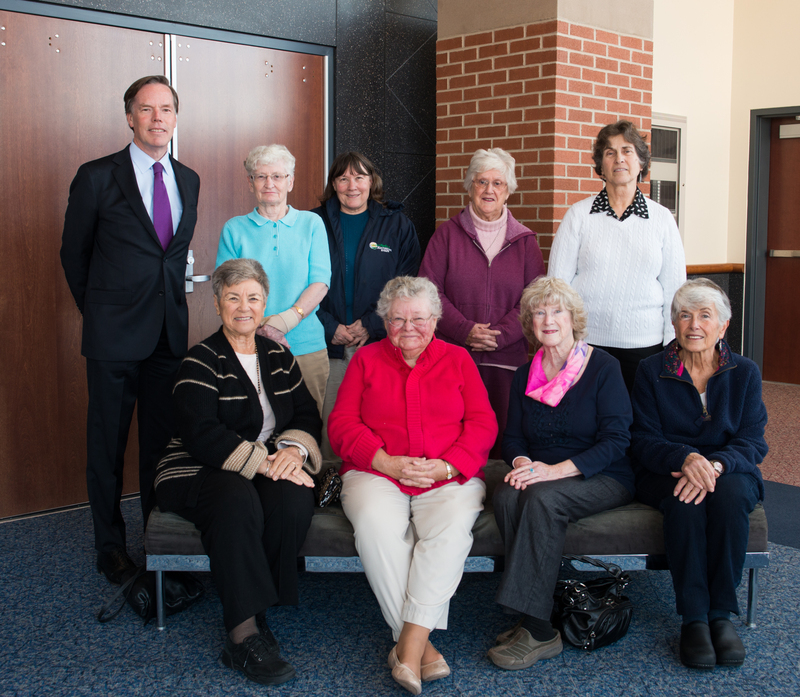 Nicholas Burns, who once served as the third-highest official in the U.S. State Department, joins members of the Guilford Senior Center before the start of the program. Those individuals in their middle-age years and older remember well the wall coming down. Some can vividly recall the scenes on television as throngs of East Germans standing on and pushing through the gate. To most of us who grew up during the Cold War, the photos were surreal. But even Burns – someone who was an insider’s insider and was well aware of the movements toward greater freedom in Poland and Hungary earlier in 1989 – did not believe that “point in the future” would be in November of that same year. That point of view was shared by most Americans, who dreamed of the day the Wall would fall, but did not believe it was imminent. Cindy Simoneau, chairwoman of the SCSU Journalism Department, asks a question of the panel during the university’s forum marking the 25th anniversary of the fall of the Berlin Wall. The panelists are (from left): keynote speaker Nicholas Burns; Kevin Buterbaugh, SCSU professor of political science; Eileen Kane, assistant professor of history at Connecticut College; Steven Breese, dean of the SCSU School of Arts and Sciences; and Troy Paddock, chairman of the SCSU History Department. Kevin Buterbaugh, a Southern professor of political science and expert on international relations who was among the forum panelists, added that even Soviet troops stationed in East Germany were taken by surprise on Nov. 9, 1989, and that they anticipated getting an order to close the border after it had opened. But that order never came from then-Soviet leader, Mikhail Gorbachev. That made the fall even more dramatic. Now contrast that feeling that the Wall was going to be with us for many years, with the life view of most college students and all of the high school students attending the event. The students watched intently at the clips of the wall’s construction, the famous speeches at the Wall by Presidents John F. Kennedy (1963) and Ronald Reagan (1987), and the Wall’s demise. Shelton High School students are handed programs and goody bags on their way into the ballroom for the Berlin Wall forum. 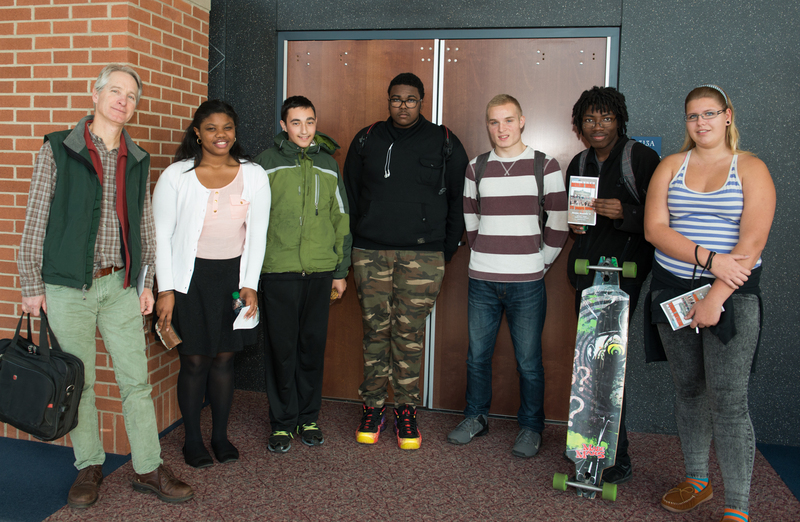 Students from Sound School in New Haven gather outside the ballroom after the forum. To them, it was history. Not living history. But history a la the way many adults today think of World War II. To them, the concept of a wall preventing free access across one of Europe’s major cities is foreign. They never remember a time in their lives when that was the case. It’s difficult to imagine such a thing. But that’s the way history goes. One generation’s vivid memories are the next generation’s history. And it won’t be long before a new generation of high school graduates, and college graduates, will not have been alive when we were hit with the 9/11 attacks. The forum can be viewed online in its entirety at CT-N. The men’s soccer team is used to having players from all over the globe. England, Scotland, France, Israel, Serbia, and Trinidad and Tobago are among the countries that have been represented over the years. But this year, the Owls are relying on a troika of Norwegians to ensure success. Jonas Folstad and Mads Larsen, natives of Trondheim, made the journey from across the Atlantic for the 2012 season. The pair had previously played together and attended the same school in Norway. A year later, Oslo’s Markus Jacobsen arrived to turn the duo into a trio. All three have been starters since their arrival on campus. This year, each is playing an integral role as the Owls look to cap their best season in several years. The Owls won their first nine games of the year to elevate as high as No. 5 in the National Soccer Coaches Association of America Division II poll. The 9-0 start was the team’s best since 2002, when it won 11 games in a row to open the year. The No. 5 national ranking was also the highest for the Owls since 2007. Larsen and Folstad, now juniors, have clearly established themselves as team leaders. In fact, Folstad is serving as a captain for the second year in a row this fall. However, it wasn’t so long ago when each was faced with the decision to leave home for an opportunity in Connecticut more than 3,000 miles away. By the time Jacobsen joined Folstad and Larsen the following fall, the newest Owl had a built-in advantage. Each has enjoyed individual success during their time as Owls. Folstad earned All-Conference and All-Region honors a year ago, while Larsen collected All-Conference laurels in 2013. Jacobsen ranks among the team leaders in points as a sophomore. All three featured in season-ending conference honors again this year, along with four other Owls including Danish first-team honoree Sebastian Brems, a stalwart on defense. One thing that has eluded the Owls in recent years, though, is an NCAA Tournament berth. For a program that has won a record six Division II national championships and made 32 NCAA Tournament appearances, Southern has not reached that level since the 2010 season. Thanks to the outstanding start, and a march through the NE-10 conference play-offs to the final against reigning national champions Southern New Hampshire, that trend will change this year. The Owls are expecting an at-large entry into the NCAA Tournament playoffs tonight, and will likely host first-round matches this weekend. Follow their progress on the Southern Owls site. And come out and cheer them on this Sunday when they play the winner of Merrimack vs. Philadelphia at Jess Dow Field at 1 p.m. The School of Business recently hosted on campus 350 high school students from around the state who are interested in majoring in accounting. Partnering with the School were the Connecticut Society of Certified Public Accountants (CSCPA), SCSU admissions staff, and accounting faculty. The conference was an example of community impact and engagement and of workforce responsiveness. Teachers of accounting classes from the following high schools brought their classes: AITE (Academy of Information Technology & Engineering), Berlin High School, Bethel High School, Brien McMahon High School, Bristol Central High School, Bristol Eastern High School, Cheshire High School, Coginchaug Regional High School, Crosby High School, Farmington High School, Hill Regional Career High School, Litchfield High School, New Britain High School, New Fairfield High School, Norwalk High School, Ridgefield High School, Terryville High School, Westbrook High School, Wethersfield High School, and Wilby High School. In addition to being informative for students in attendance, the event also gave the School of Business an opportunity to showcase its accounting curriculum. The accounting concentration is designed to prepare students for careers as professional accountants, and non-business majors can minor in accounting. In addition, Southern now offers a new Certificate in Accounting program for individuals interested in pursuing a career in accounting who currently hold a bachelor’s degree from a regionally accredited college in a discipline other than accounting. This program has been developed in response to the tremendous demand for CPAs in the state of Connecticut. The certificate in accounting program began at the start of the fall 2014 semester. Students take eight required courses in undergraduate accounting for a total of 27 credits. Admission to the program requires a minimum GPA of 2.3 at the undergraduate level, along with a bachelor’s degree. Students with disabilities are more likely to be bullied than their nondisabled peers, volumes of research shows. But in many instances, those perpetrating the bullying are also special education students. “This trend of disabled student on disabled student bullying is not as well-known, but it is a challenge that must be addressed by schools across the country,” said Christine Villani, professor of elementary education at Southern and the school’s graduate coordinator. She is a co-author of a paper that is scheduled to be published in the Brigham Young University Education and Law Journal. The article was co-written with Cynthia Dieterich, assistant professor of teaching education at Cleveland State University, and Nicole Snyder, a Pennsylvania attorney who specializes in education law. Villani said curbing bullying by disabled students can present particular difficulties. While typical students are generally aware when they are bullying others, students with disabilities often are not. In her paper, Villani recommends several steps that schools can take, including notifying and working with parents of the students engaging in bullying or being bullied; teaching special education students the skills they need to avoid bullying or being bullied, using the best education tools available; and most important, fostering the development of social skills among special education students. Villani said that having those skills is even more important for special education students after they finish school and begin “real life.” “That’s when having social skills is imperative,” she said.